The focus of the broadcast, however, was always the pay-per-view model. While it was originally thought that they’d charge $24.99 for the experience, the final price to order The Match on PPV was $19.99. Doing so would give viewers access to the live stream as well as the ability to watch a replay for 48 hours afterward. Even at that price, that’s still well below the market rate for most PPV events that TV viewers have become accustomed to viewing. While the value and worth of paying to watch what’s essentially a friendly round of golf between buddies has been debated ever since the announcement, it was clear that a market existed and plenty of people plunked down their money for the right to watch Tiger vs. Phil on their TV, B/R Live, or on an app via their phone. That’s what made it so weird when people starting showing up at B/R Live’s website or app and realizing they could just watch the entire event for free. Somehow Bleacher Report Live is allowing anyone who goes to the website to watch Phil-Tiger for free. Twitter started going after Rovell for bringing attention to what they assumed with some kind of loophole that was allowing people to watch the event without paying. They figured any minute now that Turner/Bleacher Report would notice that and remove access to the feed. However, it turns out that the free feed wasn’t the mistake. It was the solution. What a distaster for Turner/Bleacher Report. It appears they’re just going to give the stream away for free. #TheMatch. There’s not an option to purchase it in the app. No word yet on what it means for those paid $19.99 for access to the event and if they’ll receive a refund because anyone with an internet connection could end up watching. We’ve reached out to Turner and Bleacher Report for comment and will update with any response. In the meantime, the B/R Live Support Twitterfeed is responding to unhappy customers who want a refund by letting them know how they can still watch the event. To access Capital One’s The Match, please visit https://t.co/NfhRcEaHvx on your desktop or mobile device. If you have any other issues please DM us. 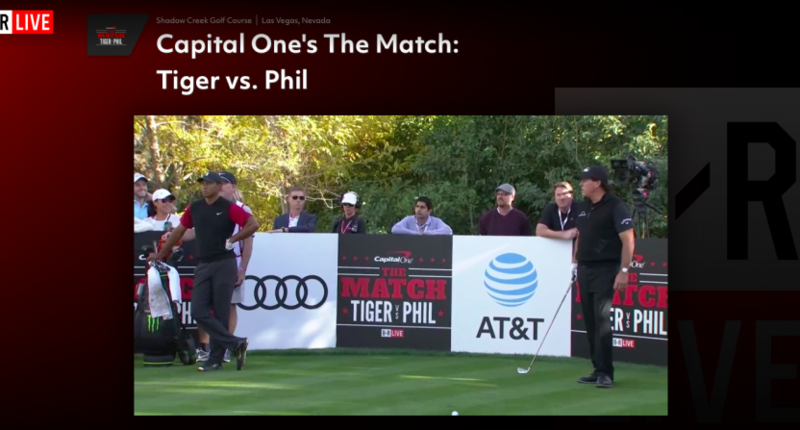 To access Capital One’s The Match, please visit https://t.co/NfhRcEaHvx on your desktop or mobile device. Expect to see a lot of post-event discussion about what went wrong, what it means for the ability of B/R Live to monetize sporting events such as these, and how Turner and B/R Live can work to prevent such seemingly simple issues from disrupting their business model next time.